A change in the nucleotide sequence of genetic material whether by substitution, duplication, insertion, deletion, or inversion..
Polymorphism expressed as existing in several different colors. (adj. 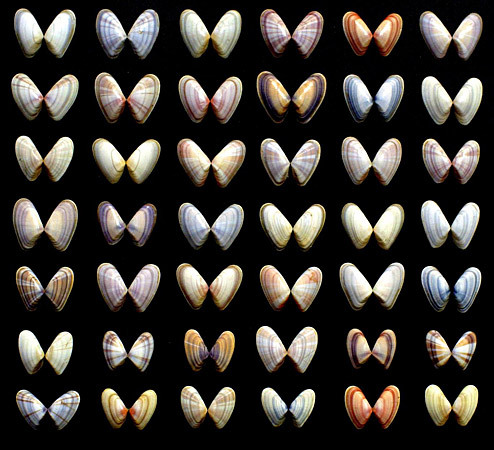 polychromic) (many color forms in a single species) is shown by these Florida Coquina Clams (Donax variabilis). Predatory shore birds recognize a coquina as food by its appearance, forming a “search image.” If some Coquinas look different, they might not match the search image of the bird, and thus might be passed over as “not food,” providing a survival advantage. In such cases, polychromism is maintained in a population. 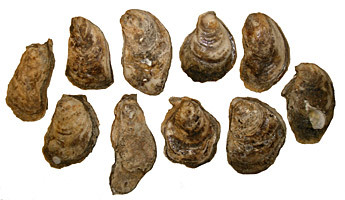 Variation in size, shape, and color of the Eastern oyster (Crassostrea virginica). There are two main types of variation: continuous and discrete. 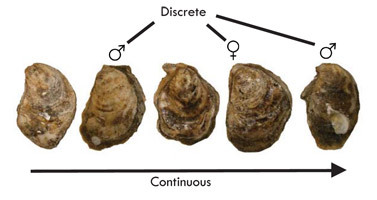 Variation measured on a continuum rather than in discrete units or categories (e.g., height in human beings, shell length in bivalves). 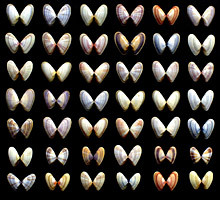 results in a spectrum of variety (for example, in shell color, from light to dark) without clear-cut, separate categories; there are not only light and dark varieties but also a range of hues (potentially every hue) in between. Variation within a limited number of categories (e.g., gender — male or female). exists in a limited number of clearly separable varieties; a good example of this is gender — most species exist in only two varieties - male and female. Continuous variation from light to dark color and discrete variation between male and female in the Eastern Oyster (Crassostrea virginica).